Hi there, hope you are all doing well, so today’s topic is how to convert or save newer version of office files into old version, why we need to convert or save file into older version? 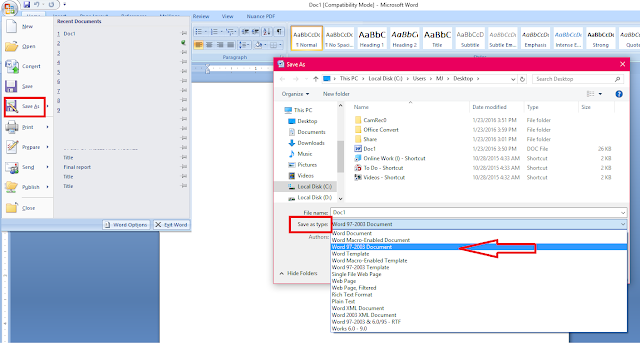 If you are using Office 2016 and need to transfer the file but the other person don’t have office 2016, now you need to convert or save file into required version, here I will show you easy and best way without using any software. This method will work all the versions and file formats like Word, Excel, PowerPoint. 2. Give the file name and set location now click on “Save as type” and select your required version, ex: if your using office 2016 you can convert into 2013, 2010, 2007 or 2003, so like this you can save as any office version file into older version.